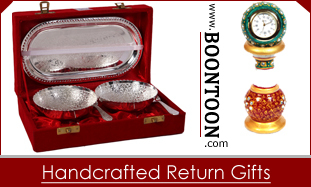 Boontoon online portal specializes in traditional cultural gift items. Boontoon was launched on 16th march 2014, on the special occasion of Holi. Its corporate office is located in Jaipur (Rajasthan). Boontoon was founded in the year 2013 by Mani, Garima B and Amit Khemka, both IT professionals having an experience of more than 10 years in the field of IT. The purpose of our website is to provide online gifting solution at a very reasonable price with a concept of change in the gifting tradition. Giving gifts are an expression of gratitude, a sentiment that connects you emotionally with your loved ones as you are not able to connect to them on the daily basis. Boontoon has taken its inspiration from the glamour and fame that emanates from the county of Boontoon. The website’s exclusive handpicked gift’s have a joyful impact enhanced by their high quality, style and individuality. The “Boontoon” online store has been organized into several categories to cater the customers like- gifts for her, gifts for him, thank you gifts, sorry gifts, corporate gifts meaning whomever a customer is looking to buy for, suitable gifts can be found quickly and easily at our website with the easiest browsing. Gift’s include rajasthani traditional jewellery, unique handicraft items, cool chocolates, corporate gift items. Customer’s can also find various unique handicraft items which they would love to buy and present. Boontoon also caters in seasonal gifts like holi, diwali, woman’s day, Christmas, valentine’s day, brother’s week, friendship’s day and as well as exciting wedding favours to compliment every big day. Boontoon is an exciting new website, offering customers unique and thoughtful gifts for every occasion coming along the way. In addition to offering a comprehensive and exciting range of products to “make someone smile today”, they are currently looking for additional new products to compliment their exciting range. Our core team from Boontoon is specialized in picking up the gifts from our manufacturing partner according to the tastes & preferences of the consumer in today’s modern era.